Proprietary trading. HFTs could be organized in a variety of ways, typically as a proprietary trading firm, a proprietary trading desk of a multi-service broker-dealer or as a hedge fund. 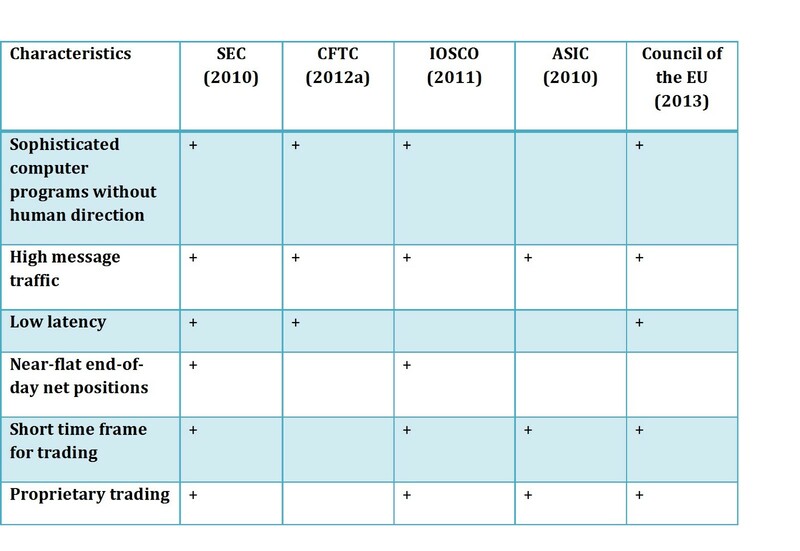 Major regulatory HFT definitions are summarized in Table 1. Academics papers (see for example Brogaard 2010; Fabozzi, Focardi, Jonas 2010; Chlistalla 2011; Golub 2011) commonly characterize HFTs as fastest algorithms which generate a large number of orders and trades with a short holding period of positions. There are many studies examining the behavior and impact of HFT on the financial market. Most researchers use transaction and order flow data with HFT attributed records flagged by exchange or other data providers. For example, there is a large set of studies analyzing data provided by NASDAQ OMX and New York Stock Exchange (NYSE). NASDAQ OMX provides the HFT data to academics under a non-disclosure agreement. These datasets contain trades records time-stamped to the millisecond and identifying the liquidity demander and supplier as a high-frequency trader or non-high-frequency trader. Firms are categorized as HFT based on NASDAQ OMX knowledge of their customers and analysis of firms’ trading, such as how often their net trading in a day crosses zero, their order duration, and their order to trade ratio (i.e. NASDAQ OMX cannot identify all HFTs). Firms not included are those that also act as brokers for customers and engage in proprietary lower-frequency trading strategies, e.g., Goldman Sachs, Morgan Stanley, and other large integrated firms. HFT who route their orders through these large integrated firms cannot be clearly identified so they are also excluded. The 26 HFT firms in the NASDAQ OMX data are best thought of as independent proprietary trading firms (Hendershott, Riordan, 2009; Brogaard 2011a; 2011b; 2012; Zhang 2010). There is more detailed information available from NASDAQ OMX, which identifies trading by individual HFT firms (Hirschey, 2013). Trade records on exchanges include a Market Participant Identifier (MPID) indicating the broker/dealer making the trade. One consequence of these arrangements is that it is possible to observe the activity of sponsored access customers directly rather than at the aggregated broker level. The firms classified as HFTs typically use low-latency connections and trade more actively than other investors. Members who engage in both proprietary and client trading. The advantage of classification with respect to the US dataset is that, along with the HFT group, they also identify a group that is free from HFT activities (members who primarily trade for clients). Benos and Sagade (2012) analyze data from the SABRE database. The SABRE database is maintained by the UK Financial Services Authority (FSA) and contains information on transaction prices, sizes, time, location and counterparty identity. It also identifies the buyer and the seller in each transaction as well as whether the counterparties execute a given transaction in a principal or agent capacity. The SABRE database describes the trading activity of all firms directly regulated by the FSA as well as that of firms that trade through a broker (because brokers are regulated and as such must report their clients’ transactions). SABRE include the trades of some of the largest HFTs. Knowledge of the identities of the counterparties in their sample allows identifying HFTs. To do that, they use press reports and the companies’ websites to see which of them are described as HFTs or define themselves as such. For instance, if a company defines itself as a “High-Frequency Trader (HFTs)” (or alternatively a “low-latency trader” or an “electronic market maker”) then they classify it as an HFT. This is informative data, but agents have predefined types. The article on Xetra market distinguishes algorithmic trading using information about fees. In fact, in December of 2006, the Deutsche Börse (DB) introduced its fee rebate program for automated traders. Agents using this program were flagged as algorithmic traders. While most of the authors conduct research on market data resolved by agents’ types, there is a small, but important, number of studies that implement algorithmic HFT identification based on agent-resolved data. This is particularly relevant for us since we have access to agent-resolved data for the Singapore market. An account is identified as Fundamental Traders when its end of day net position exceeds 15% of its total trading volume during the day. It is further categorized as Fundamental Buyers or Fundamental Sellers depending on their trading directions. Intermediaries accounts are identified with the following two thresholds: 1) net holdings fluctuate within 1.5% of its end of day level, and 2) end of day net position is no more than 5% of its daily trading volume. HFTs are defined as the top 7% of Intermediaries according to daily trading volume. Small Traders are defined as accounts with a trading volume of 9 or fewer contracts. All other accounts are named Opportunistic Traders. By using this classification, authors represented graphically the ecology of different account with the plot shown in Figure 1. 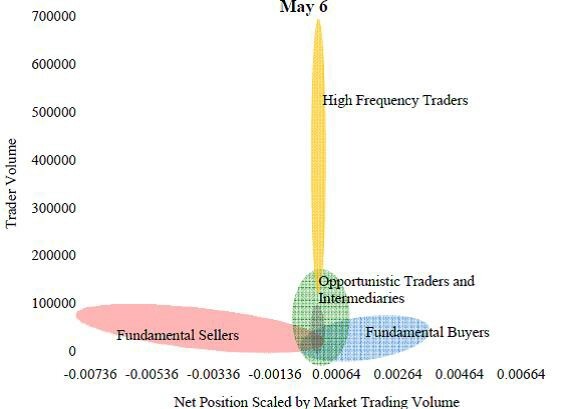 On the x-axis authors reported the net end of day position scaled by market trading volume, while on the y-axis they reported the total volume traded by the account. The clouds of points in the plane are then clustered in the 5 groups of large trader described above. It is clear that HFTs emerge as very active accounts (in terms of traded volume), but ending the day with an inventory very close to zero. According to the authors, HFTs, are clearly distinguishable from the other types of accounts. labeled as engaging in HFT activity in at least 50% of the days it trades and must trade at least 50% of possible trading days. The Investment Industry Regulatory Organization of Canada presented the study of High-Frequency Trading Activity on Canadian Equity Marketplaces (IIROC, 2012). 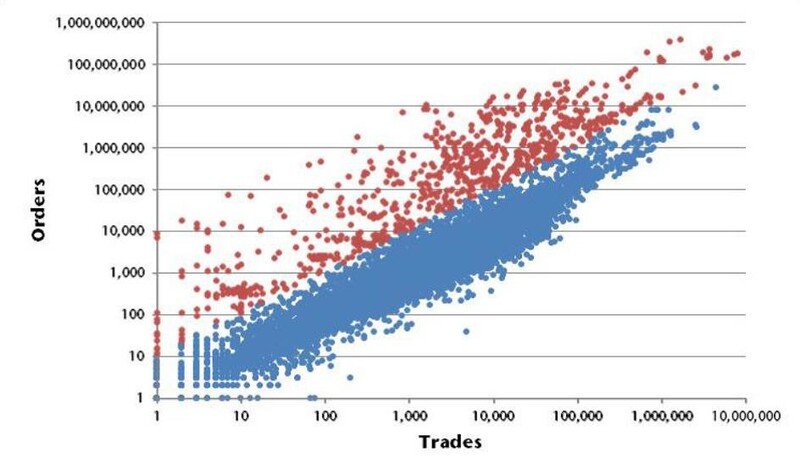 The study identifies High Order-to-Trade (HOT) group, which is considered as a proxy for the group of HFT agents having an order-to-trade ratio greater than approximately 11:1. Figure 2 shows the scatter plot of order-to-trade ratio vs the number of trades for each account in the period from 1 August to 31 October 2011. For each account for each month, the number of trades is plotted against the number of new and amended orders. A total of 947 observations (marked red) are included in the HOT group, representing 11% of the agents’ population. The HOT Group accounted for 94% of the new and amended orders entered during the study period, 42% of the number of trades and 32% of the traded value. The major drawback of HOT classification as a proxy for HFT is that it doesn’t imply message rate threshold, therefore (a) embraces slow human agents with low message traffic (e.g. less than 100 per month), (b) drops off high message rate (i.e. 1 million orders per month) agents with lower order-to-trade ratio. at-best ratio, which is the number of orders that are placed at the best price plus the number of orders priced at market divided by the total number of orders. Very small and infrequent traders with less than 1,000 orders or less than $1,000 total turnover or an average holding time were excluded from analysis. Each trader was scored on its relative position within the distribution of each metric. A value in the top quartile was assigned four points, a value in the third quartile was assigned three points, and so on. Summing all scores for each trader gave a high-frequency trading index for that trader for that day. Scores ranged from 24 to 6. Traders were then ranked by score and the highest 15% were classified as HFT for that day. The number of accounts classified as HFT varied between 45 and 70. The analysis was based on trading of equity securities within the S&P/ASX 200. The S&P/ASX 200 was chosen because it represents 95% of total equity turnover in the Australian market, and it includes the most liquid securities. The period analyzed was from 1 January to 30 September 2012. The study has found that high-frequency trading in Australia is dominated by a small group of trading entities, with the 20 largest high-frequency trading entities accounting for approximately 80% of all high-frequency trading turnover (or 22% of total equity market turnover). 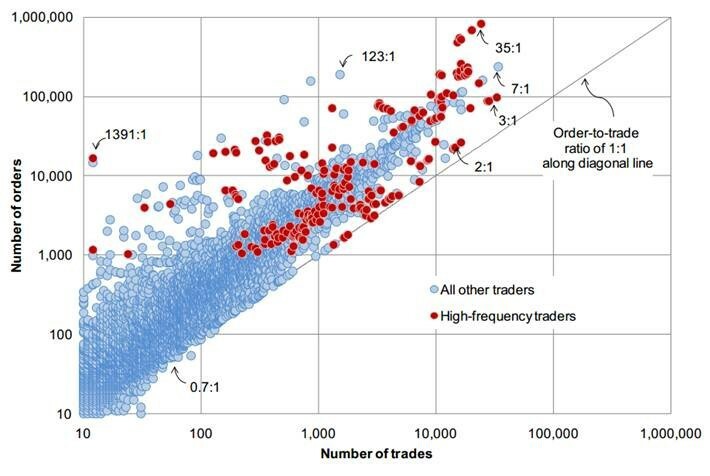 Figure 3 shows a scatter plot of orders-to-trades ratio versus the number of trades for both high-frequency traders and all other traders across a large number of securities during a period from 2 to 6 July 2012. The main drawback of ASIC methodology is that the threshold (top 15%) seems quite arbitrary and it is not well justified. Moreover, dynamically defined classification may result in the inconsistency of the HFT group in time, since population stability of the group is not controlled. Various studies propose approaches to build HFT classification based on their anticipated strategies. HFT firms are private and information on how they trade and what strategies they use is not public, hence some specific methods of trading can have lack of description. Description of HFT typology can be useful for further classification of HFT strategies in Singapore market. However, the classification is market-specific, because some strategies can be implemented only in some markets. For example, rebate trading requires a favorable fee structure, which is present only in some markets (for example in the US). 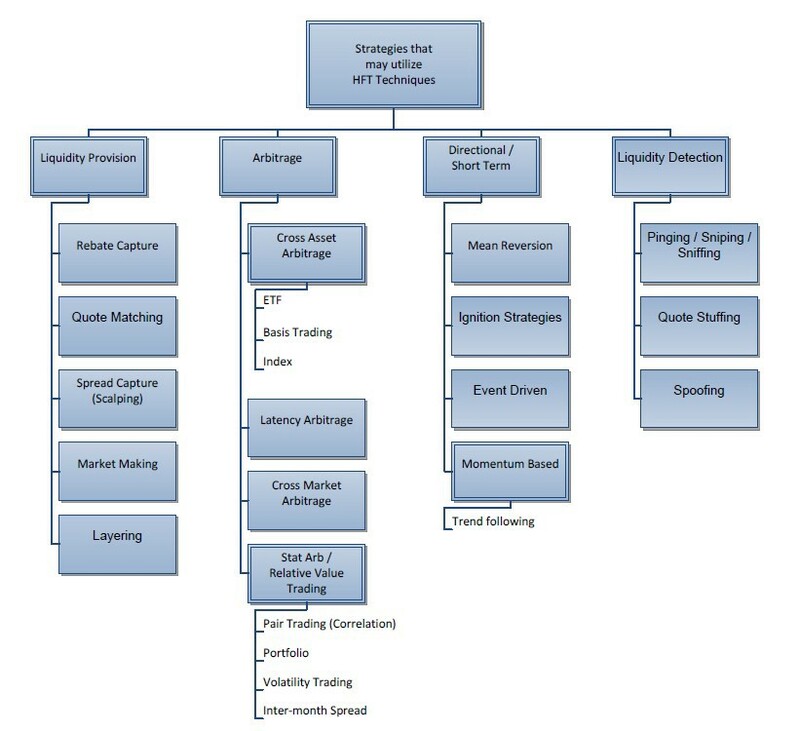 CFTC Technology Advisory Committee (2012b) defines 4 groups of strategies, which may be used by HFT (see Figure 4). This classification is one of the most complete typology of HFT. All these strategies depend on latency aspects of execution because market inefficiencies or some arbitrage opportunity exist only in the scale of seconds and milliseconds. Statistical arbitrage — seeks to exploit pricing inefficiencies either between related assets or markets. Electronic liquidity providers — involves making a two-sided market with a view to profiting by earning the bid-ask spread. Liquidity detection — seeks out whether there are large orders existing in a matching engine. Some liquidity detection strategies are described as ‘predatory’ in nature. Technical Trading — discovers technical setups based on pre-defined recurring patterns in stocks prices. Market-making presence as the fraction of snapshots where the account has a limit order posted at either side of the bid-ask spread. Using these metrics, they divided HFTs into market makers and opportunistic traders (arbitrage or directional strategies). As a result, agents with more than 20% market-making presence on average across stocks are likely to have market making as their main business model. Kirilenko, Kyle, Samadi, Tuzun, (2011) identify three different subcategories of HFTs based on their aggressiveness, noting that the aggressiveness of a given HFT firm is highly persistent across days. The subcategories are Aggressive, Mixed, and Passive. The identification is based on how frequently the HFT firm initiates a transaction. Aggressive HFT is required to initiate at least 40% of the trades it entered into. It also must do so for at least 50% of the trading days in which it was active. To be considered a Passive HFT a firm must initiate fewer than 20% of the trades it entered into and must do so for at least 50% of the trading days during which it is active. Those HFTs that meet neither the Aggressive nor the Passive definition are labeled as Mixed HFTs. Prospective approach for HFT agents clusterization was proposed by Steve Yang et. al. (2011) based on the reward function that in some sense better explains the observed behavior of an agent. They use different classification techniques based on the learned reward functions i.e. Linear Discriminant Analysis (LDA), Quadratic Discriminant Analysis (QDA), and Multi-Gaussian Discriminant Analysis (MDA) to distinguish HFT from other trading strategies. This approach is not applicable for identification if we rely on the formal HFT definitions, but it can be useful for clusterization based on the typology of HFT.